So just as history repeats itself with Charlotte needing another dilatation, it also repeated itself with the op to perform said dilatation being bumped. Last time it was because she had a cold, this time it was because there were more acute cases needing the surgeons attention (Charlotte herself being one of those acute cases). I don't begrudge them that. I'm grateful she isn't worse off, and it isn't anyones fault the schedule got busy today (we've been told she will be rebooked for a couple of weeks from now, which will in theory be an unbumpable fixture). It's just frustrating to be there ready to go, having gotten up early (so early Charlotte needed to be wakened, and she is usually Early McEarlyson when it comes to getting up in the morning), been in the ward for a couple of hours, seen the anaesthetist and signed his consent form, meeting the surgical team and having the risks and conditions explained and signing that consent form, then settling down to wait for the call to theatre, only to be told it's all off and you can come back in a couple of weeks provided she is okay right now. Which she was, need for the op aside, the blockage at the root of this weeks adventures having resolved itself in the two nights between when it happened and this morning. Buildup and let down. It has been a tiring couple of days. Still, while waiting she got to play around with some new toys, taking her friends along for the ride (along with Tigger is also shoehorned in there with her along with Piglet ). She liked the toy room so much she didn't want to go home. 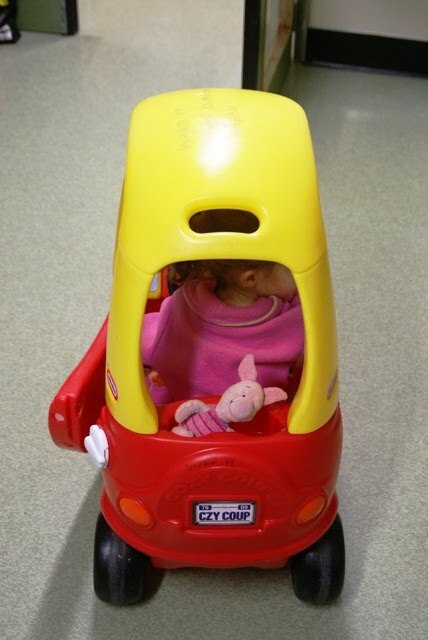 Piglet would go on to have his own solo adventure this afternoon after being left in the play area at the mall. We had given him up for lost (just like her original Thomas engine, which is having a long holiday at the new Kilbirnie sports centre), when the mall rang to say someone had handed him in. Which is good, since I am probably just as attached to the little guy as my daughter is. I was thinking of you and thought I would check in...what. a. hassle. I am glad she is ok, though. Hopefully there will be no incidents until the next "unbumpable" appointment!